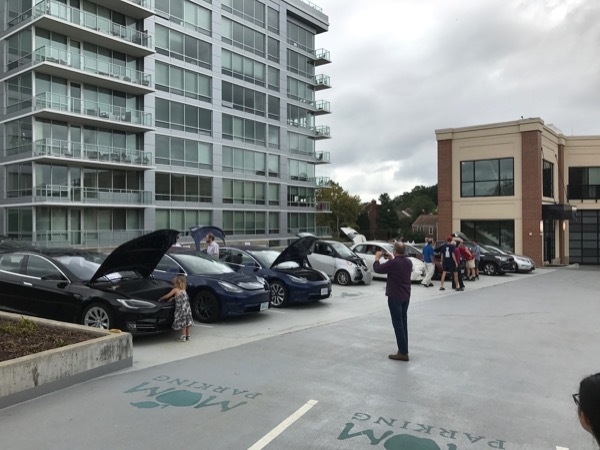 We had a really great turnout for our 2nd Annual National Drive Electric Week event, both with registered vehicles and attendees. We had 27 vehicles registered on our event webpage (18 of which were showcased today), and about 100 attendees. Our event was picked up through 29 different media sources (social media, news, local blogs, forums, and association sites). Our event date was scheduled the same day as another well-known local NDEW event -- located in Purcellville, VA -- so we had many of those attendees split their time between venues. Our team of 3 staff was able to pass on much of the Plug-In America flyers and informational handouts to our organic market customers, many of which are already EV or hybrid vehicle owners. Our team vote for favorite attendee EVs would be: the 2015 Tesla S with the Nikola Tesla hood artwork, and the 2013 Fiat 500e. We had a really great time, the attendees really enjoyed themselves as they connected via their EVs, and the other customer attendees were engaged, curious and thrilled to see what the EV world was showcasing -- on 2 and 4 wheels! MOM's Organic Market was proud to be a part of 2018 National Drive Electric Week, and we look forward to collaborating for next year's event! Big thanks to all of the EV attendees who drove near and far to participate, and to Plug-In America for the great work! Protect and restore the environment! A snapshot of the very cool EVs showcased at MOM's Organic Market - Arlington for 2018 NDEW! MOM's Organic Market - Arlington is proud to be an event host on the 2018 National Drive Electric Week tour! We plan to showcase EVs at our store, as well as our on-premise charging units. We'll be inviting local environmental partner organizations and businesses here to table on electric and other alternative car-free transportation options and relevant information. We'll be offering in-store samples from our 100% organic vegetarian cafe, Naked Lunch. Feel free to reach out and contact the event organizers if you're interested in attending with an EV, tabling for an organization, or with any media inquiries. If you were a 2016 event attendee with an EV, we'd love to have you back! Our mission at MOM's Organic Market is to "Protect and Restore the Environment," and we hope to showcase the best of the electric life on two wheels or four! Registered attendees report 481,227 electric miles driven.